To celebrate the upcoming International Translation Day I'm working on a new collaborative article and I invite you all to participate! 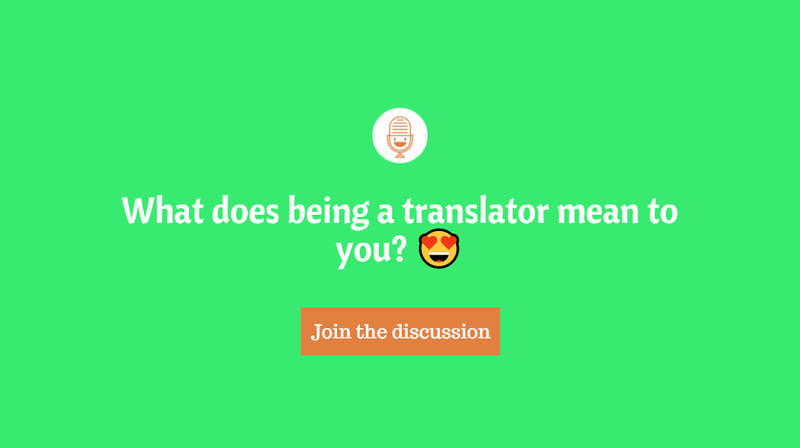 Just answer one simple question: "What does being a translator mean to you?" Your answer should be no longer than 3-5 sentences. All your answers will be published on the 30th of September on The Open Mic! Thank you so much to everyone who will decide to participate! Translator is a nobleman or noblewoman who translates source language to target language. Also, he or she is a political researcher. President or classy politicians speak through translator. Translation is a critical job, and you may save the world by classy translation. amirsalr Translation is a critical job, and you may save the world by classy translation. Very interesting way to put it, @amirsalr! Hey @Dmitry What a great initiative. By translating you get to know the world, you connect individuals with the people that matter to them, you understand and value differences. eleonorang By translating you get to know the world, you connect individuals with the people that matter to them, you understand and value differences. What a wonderful sentiment @eleonorang! Thanks for sharing! To me, translation means freedom. The freedom to choose your clients, your projects and the days or times you work. And above all the freedom to finally be able to combine, in a profession that pays well, a range of slightly odd skills – being fussy about grammar and spelling, enjoying research, knowing about a wide variety of obscure subjects, being perfectly happy working alone for hours or weeks at a time, loving to write... To me, being a translator is the best thing in the world! JaneD To me, being a translator is the best thing in the world! I wholeheartedly agree with you @JaneD! Thank you for sharing this! JaneD You do make it sound like a great profession! To me being a translator means omnipresence. You give a lot to a translation: time, dedication, struggle to find the right words etc. By doing so, your translation carries something that is truly yours. Eventually your work will be published and sent in different countries and to different people. That's why I call it omnipresence. Gentiana Eventually your work will be published and sent in different countries and to different people. That's why I call it omnipresence. Good one @Gentiana! Thanks for sharing! Being a translator means that I can balance being in- and outside of projects, discussions, negotiations - I am more of an observer than a participant, and this is a role in which I feel very comfortable. I see translation as my way of having an impact on the world and influencing, enhancing the success of my clients. It is a calling of sorts. Thanks for this @DianaJankowiak! I think that role of a translator is often overlooked. We need to focus even more on that! Thanks for sharing! Being a translator means putting all of my passion. Because I have always loved languages and foreign peoples. Because I worked very hard in search for my own language. Because my long road searching meant engaging in intercultural communication. Because I discovered my place in the world that way! fadesga Because I discovered my place in the world that way! That's excellent! Thank you so much for sharing @fadesga! fadesga It's a great feeling, discovering your own place in the world... Did you also try other paths before deciding for translation? To me, being a translator means helping people gain access to information that otherwise would have been unavailable to them, and information is power. Besides, reading and practicing my languages are part of my job, but as they are activities I enjoy a lot, it doesn't feel like working at all. This is really the job I never knew I needed! Translation brings together lots of things that I love: storytelling, communication, learning (to name a few). Being a translator is bringing information, stories and culture from different parts of the world to people who might never have the chance of learning a second (or third) laguange. It means facilitating communication in small (individuals) and big scale (corporations). And I learn something new everyday! Either new words, or instructions to use a new equipment!